In honor of Thanksgiving, we’re sharing 18 of our favorite dining rooms, and all of them have brilliant lighting. Whether an industrial penthouse, a minimal Hawaiian villa or a rustic Southwest ranch, all of these dining rooms were created to be welcoming spaces for gathering friends and family. Sometimes, the view is the prime focus of a dining room and designers choose lighting that can blend into the background. On the North Shore of Oahu, interior design firm McCormick & Wright chose the simple Archetype drum Pendant by Michael Vanderbyl for their minimal dining room to not distract from the magnificent ocean view. Similarly in Chicago, Blutter Shiff Design Associates chose the airy Cartesian Pendant so the view of Lake Michigan could take center stage. Archetype Pendant. Interior design by McCormick & Wright. Cartesian Pendant. Interior design by Blutter Shiff Design Associates. Archetype Pendant. Interior design by Jeffrey Silberstein. Other times, dramatic pendants are chosen to be the focal point of a room, like the luxe San Miguel Chandelier by Fisher Weisman with its dangling brass “spoons" or the spiky Comet Chandelier by HTK Design. San Miguel Chandelier by Fisher Weisman. Comet Chandelier by HTK Design. Cascade Divide. Interior design by Shane Reilly. Prosecco Chandelier by Jamie Drake. Topanga I Chandelier Two-Tier by Jamie Drake. Cascade Luminaire in Charleston, SC. 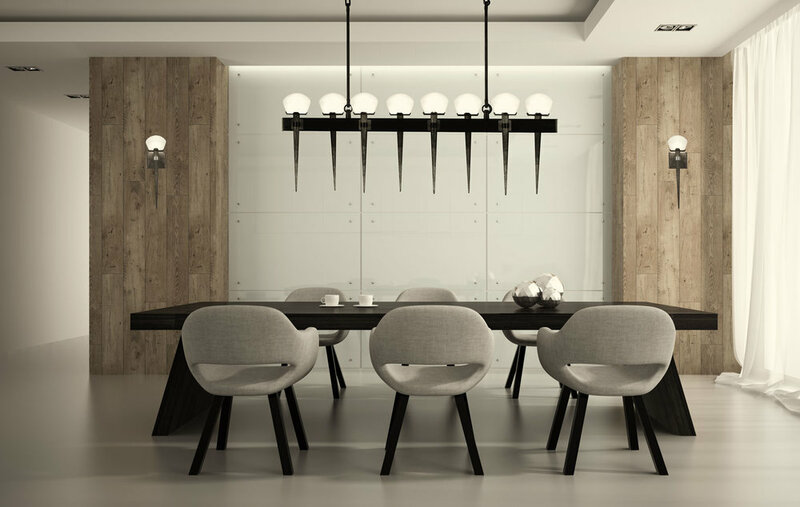 Hop over to Pinterest and browse through our dining room ideas (all featuring Boyd Lighting). LED lamping, sturdy construction and durable materials make these pendants the perfect choices for hard working dining rooms. 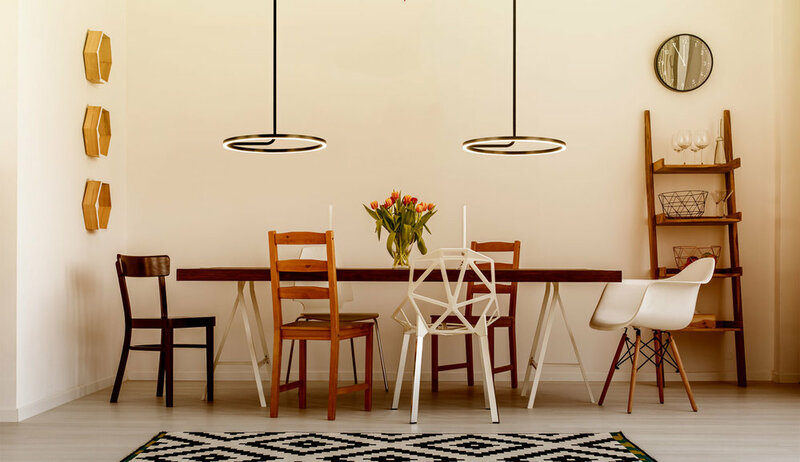 Energy efficiency comes in the way of LED lamping, and two great choices are the Hoopla Pendant and the T-Light Pendant. (Don't just take our word for it; the T-Light was designed by Aidlin Darling Design, an architecture firm that believes in environmental responsibility.) For hard working design, look to the Parisian Pendant, winner of Design Journal's ADEX Award for superior product design. LED T-Light Pendant by Aidlin Darling Design. Crisscross Pendant. Interior design by Ohashi Design Studio. Parisian Pendant, winner of Design Journal's ADEX award for superior design. LED Spectro Pendant. Source: Luxe Magazine. Photo: Dominique Vorillion. To-Ji Pendant by Jiun Ho. See the full line of Boyd Lighting pendants HERE. Happy Thanksgiving!